While the airplane descends, I look out of the window and see the snow-covered peaks of Svalbard. It’s light outside, even though it’s the middle of the night. The sun won’t set until August. In the middle of this snow-filled landscape, on top of a mountain plateau near Longyearbyen, I see a number of large white globes: antennas that maintain contact with satellites that transmit large amounts of data to these ground stations, every time they make an overpass. There is a good reason as to why these antennas are positioned here, on an icy archipelago with perhaps as many polar bears as people: we are less than 1500 km removed from the North Pole. Many of the satellites that make measurements of the surface of the earth follow a North-South orbit around the world, and the antennas on Svalbard are the only ones in the Northern Hemisphere that see them with each cycle. A super-fast internet connection via an undersea cable to the north of Norway ensures that the data reaches the servers of, among others, NASA, ESA and NOAA (The National Oceanic and Atmospheric Administration of the US). This infrastructure enables researchers from around the world to do research on the earth’s surface from the comfort of their own office. They don’t need to fly through a hurricane to find out how it develops above an ocean, climb a mountain to find out how much a particular glacier melted in recent years, or go on an icebreaker through the Arctic Ocean to map the extent of the sea ice. In the past few decades, satellites have delivered a wealth of information on our planet which has become indispensable. Although I regularly download satellite data onto my computer to do further analyses, this time I’m visiting Svalbard to collect similar data myself. Together with two colleagues of mine from Tromsø, from the university and the Norwegian Institute of Nature Research, we take a snowmobile into the field to install sensors that measure the same thing at a height of a few meters as the satellites that fly over our heads at a few hundred kilometres. But if this is the case, why am I suffering through a snow storm and bitter cold, if I can also download this information back home? The reason for this is quite simple. In the framework of the research project ‘SnoEco’ at the University of Tromsø, we are trying to measure how plants are responding to the changing snow cover in the Arctic. But plants are small compared to the large distances at which satellites measure. Just try to take a picture – without zoom – from a couple of shrubs at a distance of a few hundred meters. They won’t appear any clearer on your photo than a few green pixels. The same happens with satellites. We do know how green the vegetation is, but it is difficult to find out which species its made up of. That extra bit of information is necessary to find the underlying processes that determine how plants respond to climate change and an altered snow cover. Our measurements have another advantage: we’re not hampered by cloud cover. 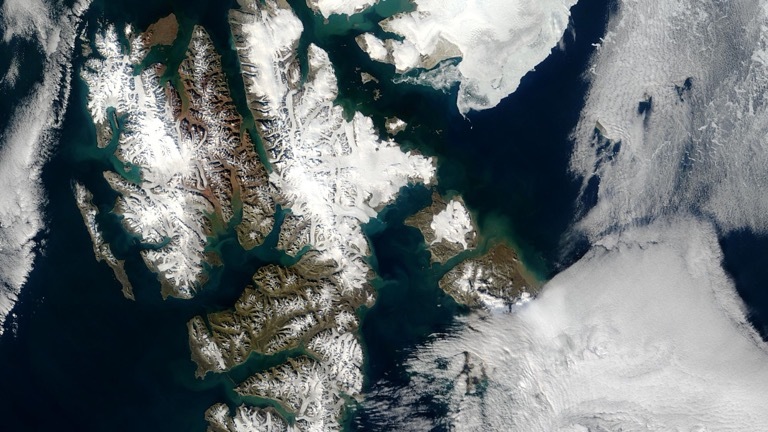 Svalbard is a very cloudy place, and satellites sometimes only acquire a few good images per summer. Our equipment can collect data day in and day out, and therefore provide much more information on plant growth, and the moment they prepare themselves for winter. We combine this detailed information with satellite data, which has the advantage of providing information about the entire Arctic, not just one valley on Svalbard. In other words, there are limits to the expansion of our knowledge of the world, brought to us by satellites. Obviously, satellites continue to improve, with higher resolutions, but for a proper understanding of the world we still need to go into the field and stand with our boots in the snow or dirt. Unfortunately, this kind of fieldwork does not come cheap. There is often not enough budget space for it when applying for a project, while satellite data is offered for free by several space organisations. There are, therefore, research projects where a modeller, or an expert in the field of satellite research, studies the Arctic without ever having been there. And that’s regrettable. When your research topic remains abstract, it’s also difficult to stay enthusiastic about it. My advice: don’t send just field scientists to research areas. But send also the scientists that otherwise spend their entire life inside an office. Exchange programmes such as the European “Interact” make this possible for the entire Arctic. A few extra hands in the field are always welcome, especially if these hands thereby get a better sense of the complexity of our world.